Yes, polymer clay buttons can be machine washed and dried. It’s best to avoid using surface treatments like mica or paints as these may rub off with time. Varnish will wear off with time and will not protect surface treatments. Delicate sculptural elements may be broken, so it’s best to use sturdy designs. Dry cleaning and ironing may damage polymer clay buttons. Bleach does not appear to damage polymer clay buttons. Polymer clay buttons are great for embellishing children’s clothing because they are washable and durable. When my girls were little they begged me to make them some pajamas out of some flannel backed satin that had the moon and stars on it. The pajamas were cute, but they needed buttons. Polymer clay buttons were a natural choice. I made a spiral bulls-eye cane with Kato polyclay and glow in the dark Sculpey III. Then I made cane slices about 3/16″ (4mm) thick, poked a couple holes in them, and baked them. Back then I didn’t know how to bake things properly, so the glow in the dark clay promptly darkened. But I used the buttons on the pajamas anyway. Being kids’ clothing, those pajamas were washed in hot water and dried in the tumble dryer for years. The larger pair of PJ’s got extra use because my younger daughter wore those after she outgrew her own pair. The buttons never showed any wear and held up beautifully for years. But was it because I made the buttons so thick? Would smaller, thinner buttons hold up as well? Well you know me, I had to run a test. I have to tell a story. When I mentioned to my 15 year old daughter that I was writing this article, she immediately asked if I was going to write about her star pajamas. I said yes, but I couldn’t find a picture of them. She said, “No problem. I have them.” Two minutes later the actual pajamas themselves were dropped into my lap. I’m considering sending her to audition for an episode of “Hoarders, Teen Edition”. I made two styles of buttons, sew-on and shank buttons. Both were 5/8″ (16mm) in diameter and were under 1/8″ (2.5mm) thick. The shank-backed buttons were made using a commercially available button back which was embedded into the polymer clay button. (I explain how I made those in this post.) I used Premo polymer clay in white, black, and black/white swirl. Before baking I dusted the black buttons with purple mica powder (eye shadow, actually) and after baking I sealed them with three coats of Varathane, which was fully dried and heat sealed. The white and black/white swirl buttons didn’t have any sealer applied. I sewed all buttons to a piece of scrap canvas fabric and tossed it into my laundry hamper. I washed it with each load of laundry I did for the past four months. The sample went through the wash at all temperatures and each time it went through the tumble dryer with the rest of the clothes. In the beginning I tried to keep track of how many loads this sample went through, but I’m not the only one who does laundry in the house and that quickly became impossible to track. But a broad estimate would be that this sample fabric with polymer clay buttons ran through the washer and dryer cycles over 40 times. This also included 4-5 loads with bleach and hot water. After 40 washes, the polymer clay buttons held up well. Obviously, they even held up to bleach! I have to admit that I was surprised how well these buttons held up. There was absolutely no noticeable wear on the black/white swirl buttons. The white buttons didn’t wear, exactly, but there was some slight discoloration where the top of the white shank-backed buttons rubbed against other items in the wash. Or perhaps it came from rubbing against the inside of the dryer. The buttons didn’t crack, crumble, break, or fall apart either. The purple mica buttons held up much better than I had expected. The shine was not diminished and the buttons didn’t scratch noticeably. But along the edges of the buttons, the finish wore through, allowing the mica to wear off. The Varathane is beginning to peel along the edges and I think if I picked at them, I could probably peel the Varathane off. But this wear has been slow, it’s still only barely visible, and the buttons still look great. Yes, you can wash polymer clay buttons! Premo polymer clay is durable enough to make functional, usable buttons and they are completely machine washable in all temperatures. I would expect that Kato Polyclay and Pardo Art Clay would give similar results because they are even stronger than Premo. I would not recommend using Sculpey III for buttons, however, as it is known for being quite brittle. If you are going to use paint, mica powders, or foils on your polymer clay buttons, make sure you seal them well with Varathane. Varathane covered polymer clay buttons are machine washable in the short term, but for maximum durability I recommend hand washing. The problem doesn’t seem to be with water resistance or chemical reaction with the soap or bleach. Rather it just seems that the Varathane finish wears through on the exposed edges after a while. Already a huge fan of Varathane, I was pleasantly surprised to see how durable this finish is when exposed to water and heat. I expect that liquid polymer clay used as a sealer would have similar durability, but I didn’t test it. Interested in making polymer clay buttons? Check out my article How to Make Polymer Clay Buttons. I show you how to make the buttons seen here and more. Thanks for the useful information. I have run a similar test but I did not go to the same lengths that you did and I did not put them in the dryer. I used Sculpey original and they held up after three loads. That’s interesting. I’m surprised that Sculpey held up. I found that it’s not terribly strong when compared to Premo. But maybe it’s as strong as it needs to be, LOL! Thanks for the info! Thanks for the information. Is varathan the varnish (acrylic) that you get at the hardware store? I’m glad to know they really will hold up. I don’t ever use varnish, just buff them to a high shine so the lost finish won;t be an issue. I do love a nicely sanded and buffed polymer finish. It’s so smooth and nice. But just a thought…polymer is awfully soft and it won’t stay shiny on it’s own in the wash. The friction of wearing buttons and washing them will likely cause the shine to diminish over time. But varathane isn’t a good long-term solution either. Hmm. Wow! This post is so timely, since I was hoping to teach some knitters how to make buttons for sweaters. I don’t imagine that PC can be dry cleaned though. Anyone have experience with dry cleaning? I love polymer clay buttons for knitwear. As a knitter myself, I’ve used that option many times. As for dry cleaning, I have no idea. But I suspect you’re right. Maybe I should take some buttons over to a dry cleaner and ask them to drop some solution on them and see what happens. If it works that way. I have no idea how dry cleaning works! This study is really useful – if buttons are part of garment or accessory design, they might as well be cool handmade ones that are durable. Thank you for the work you put into this test! Agreed completely! As easy as buttons are to make and sew on, there’s no reason you couldn’t even update your current wardrobe with cool buttons. This is truly a “public service” post for all of us who make polymer clay buttons. Thanks so much. I wonder if turning garments inside out to wash and dry would help with the edge wear that might be due to abrasion against the machine? I do that to my clothes in general. That’s actually a good idea. I think this test was a bit harsh because the buttons rub against each other, too, since they’re in such close proximity. Great post. Nice to have this information. I have been considering making buttons, but wasn’t sure of the durability. Now I know! Thanks! Oh good, I’m glad it was helpful. Happy button making! Hi Ginger. Thank you so much for all the great information that you provide. I’m fairly new to polymer clay and found your website and tutorials very helpful. I know this is a little off topic from buttons, but as I stated, I’ve read a lot of your articles online and greatly value your opinion. I have only used Sculpey III clay, probably because it was what was on sale when I first decided to buy some clay. 🙂 Since buying the Sculpey III I’ve read that it isn’t as strong as other brands of clay and some even say not to use it for jewelry at all. I’ve made beads and pendants and have tested their strength by trying to break them and haven’t been able to. I did use your advice and baked them longer than the recommended time for added strength and I don’t make anything that is real thin. When I first started reading your story about your girl’s pajamas, I thought Sculpey III must be pretty strong to hold up all those years but then at the end you stated you wouldn’t recommend using Sculpey III for buttons. I’m curious what your thoughts are on using Sculpey III for jewelry. I’ve included a website in the details of this post (just for your reference) so you can see what I’ve been making. I hope I am not out of line for asking this question on your article. I’ve just been reading about it the last few days and found it interesting that you published this at a time when I was searching for answers. I really appreciate you taking the time to respond. Thank you very much. Hi Wendy, if you’ve tried to break your pieces and it’s holding up fine, I wouldn’t worry about your existing pieces. I looked at your shop and none of the pieces are thin, so I can see why they’re holding up. Yay! Sculpey III is a very nice modeling clay and as such works well for making figurines and things without a lot of detail. 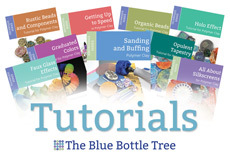 As you learn more techniques and want to explore some of the more detailed and demanding techniques you’ll likely want to try using another brand of polymer clay. They each have their good and bad features, but in general most people have very good results with Premo, Kato, and Fimo. The buttons blue/white buttons that I made do contain Sculpey III, but if you look closely you’ll see that all the Sculpey is surrounded by white or blue Kato polyclay, which is hard as nails. I don’t think buttons made from Sculpey III alone would fare very well. Just recently I used some white Sculpey in a comparison test and was able to break beads of that size in my hands. It’s notorious for being brittle and will break easily when used in thin veneers like when covering pens, glass votives, or switch plates. When I first started with polymer, I also used Sculpey III and was happy with it. But then after I used Premo and Kato I realized how mushy Sculpey III is and how poor it is at holding detail. Some of the colors also will get dark and dull after baking. It’s one of those things that becomes more obvious after you have more experience with the materials. That being said, though, there are a lot of people who do enjoy working with Sculpey III. It does have some positive characteristics. As they say, your mileage may vary! Ginger, thank you so much for taking the time to answer my questions. I really appreciate all your help! You can purchase special safety pins with little bumps on them and no loop at the bottom specifically made to use for buttons that cannot be washed. That way you can still enjoy the buttons, remove them easily and launder the item any way you’d like. The bumps prevent the button from puckering the fabric. A fabric store might carry them but a specialty notions store like Nancy’s Notions definitely carries them. Of course, this only works for shank buttons but if you are making them, you can add shanks! Works great for adding bows to clothing too. They get so wrinkled in the wash.
Oh yes, I’d forgotten about those little safety pins. I have some around here somewhere. I’ll add them to the article I’m writing for Saturday. Thank you for the reminder. They’re perfect for buttons you don’t want to wash.
Ginger this is very helpful in so many ways as always. Your readers have some great insight as well. I have been selling buttons for many, many years and I always told my customers they are not washable. I now know they are. Those jammies with your buttons are so cute. I was amazed how well those button still look. Thank you so much Vanessa. I love your buttons on your FB page! I’ve been doing some washing trials too. I’ve tried premo, fimo and Kato and flat buttons and buttons made in a flower mould. No noticeable difference on any of them after washing 35 times at a range of temperatures up to 50oC – also all ok in the tumble drier. I was surprised to find all the brands were fine as we have had some issues with fimo sat in water in snowglobes but I guess they aren’t left in the water for days when washing. I will write up my experiment sometime soon too. Thanks for sharing! Ah, so good to find that you’re getting the same results. And I think you’re right about the water resistance. I think leaving polymer clay in bleach water for days would lead to some crumbling or softening, but with it being in the wash such a short time I guess that just didn’t happen. It’s tough stuff, apparently! Oh, and Cara, send me the link when you get yours written up and I’ll add it here, too.